Many subwoofers don’t allow fine control over the phase rotation — but that’s not a massive problem, because the wavelengths around the point the sub and satellites overlap are so long. In Hugh Robjohns’ article of 2007 [http://sosm.ag/all-about-subs] you mentioned the importance of correct phase between satellites and subwoofer. Would you please be so kind as to tell me what’s going on when you cannot hear any difference between 0 and 180 degrees? Thank you in advance for your answer and kind regards from Graz! SOS Technical Editor Hugh Robjohns replies: Hello Wolfgang. I should start by saying that your assertion is not actually true! We can detect relative phase at low frequencies — in fact, this is how we are able to detect the direction of a low-frequency sound source — in open spaces. However, we lose that ability within a room, because of the confusion caused by reflections of low-frequency sound waves from the room boundaries. Returning to your main question, though, this relates to aligning a subwoofer to the satellite speakers in a studio control room. Here we take advantage of the fact that we can’t detect the location of a subwoofer within a room because of the confusion of reflected sound waves, and so from that point of view the relative phase between sub and satellites is irrelevant. However, it’s critically important to realise that the frequency range generated by the subwoofer overlaps that of the satellite speakers; the two systems usually cross over somewhere around 80-100 Hz. Throughout this ‘crossover region’ both the satellites and subwoofer are reproducing the same signals at the same time, and so your ears hear sounds arriving from both the subwoofer and the satellites at the same time. Consequently, it’s imperative that these signals arrive in phase with each other, so that they combine constructively rather than (partially) cancelling each other out. If the latter occurred, there would be a large dip in amplitude through the cross-over region which, clearly, wouldn’t be very helpful! Thankfully, this phase alignment is a very simple adjustment to make. All you need is to play a sine wave tone at the appropriate crossover frequency (typically 80Hz) — so that both the satellites and subwoofer are reproducing the same signal. In this condition you can then adjust the subwoofer phase to find the loudest perceived output at the listening position. 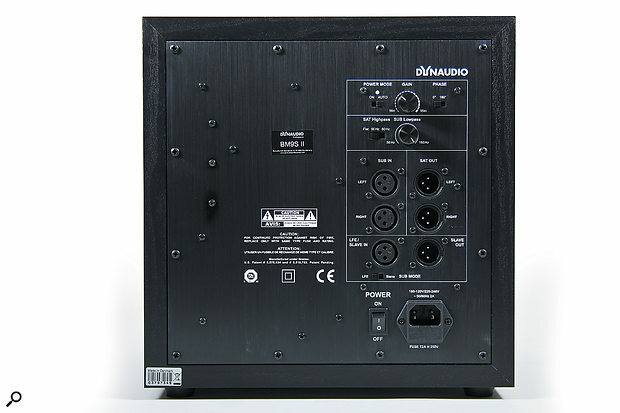 Some subwoofers provide a continuous phase adjustment while others offer switched options (either 0/180 degrees or 0/90/180/270 degrees). This is acceptable because the wavelengths involved are so long that the precise phase alignment is not that critical. Whatever facilities are provided, the loudest output occurs when the signals from satellites and subwoofer are in phase with each other. Once the subwoofer phase is optimised, you can adjust its level to blend with the satellites to provide the seamless bass extension it’s expected to deliver.